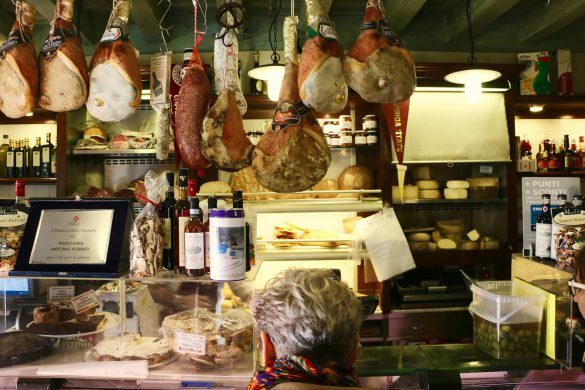 Finding quality food, not sold by crowded tourist restaurants is difficult in Venice. The truth is, local eateries are still unknown to visitors – you need to know where to look. 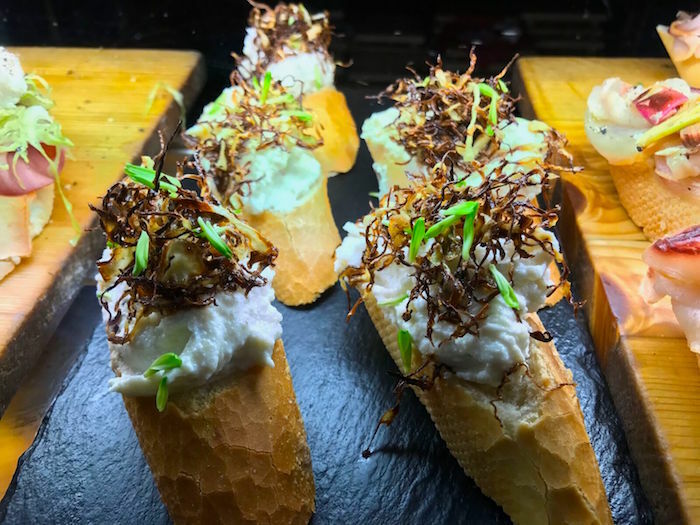 By far, the best way to try authentic specialties in the Floating City is by heading to a local bar and ordering a plateful of Venetian cicchetti. Here’s our list of the top 10 cicchetti bars in Venice. When most people visit the Floating City, they often only stay for a day or two. This means you must really use your time wisely, as Venice provides tons of things to do and see. Discover our guided tours that will help you explore the city, learn its rich history, and make the most out of your Venetian vacation. We even have a Venice food tour that will allow you to taste the most delicious cuisine in the city! If you have been to Venice before but haven’t had the experience of trying “cicchetti” and “ombra” at a “bacaro”, you’ll need to go back. 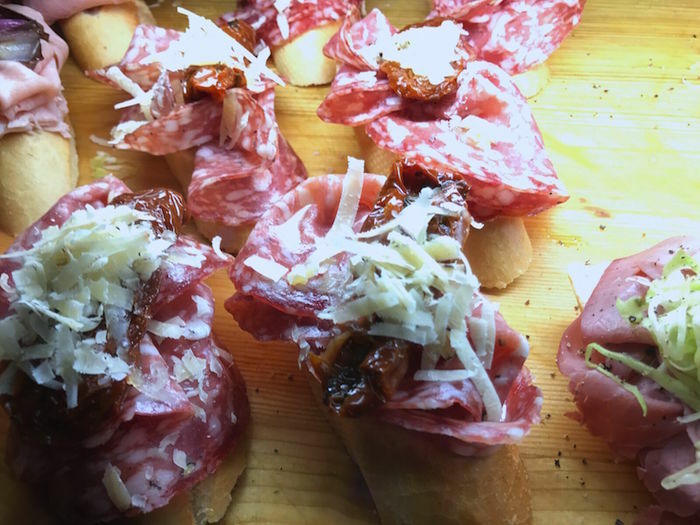 Venetian cicchetti are local finger foods, serving as the main elements of every authentic happy hour or social gathering. They’re served at bacari, the local bars in the Lagoon, alongside a glass of red or white wine, called ombra (shadow). These delicious small bites can be enjoyed as starters, before dinner, or even as a meal. Cicchetti in Venice are also cheap, ranging from €1 to €2,50 per piece, so locals usually hop from one bar to another to try all the different specialties. The offer depends on the seasonal products available and the fresh catch of the day. 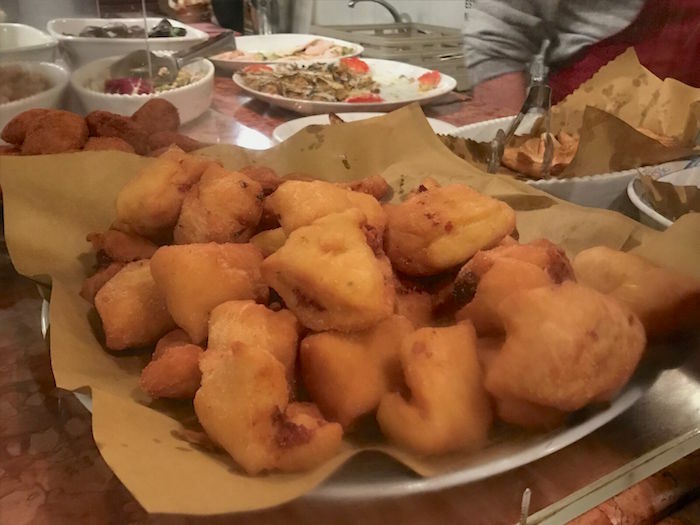 Most bacari serve an assortment of fried fish (such as calamari and sardines), mixed vegetables (called frittura mista) and traditional Venetian dishes made with local fish, meats and cheeses. For a better experience, start your tasting experience early in the evening, or even at lunch time. Bacari are usually tiny, so this way you’ll avoid crowds and will find seating. Besides, day drinking in Venice is perfectly acceptable. 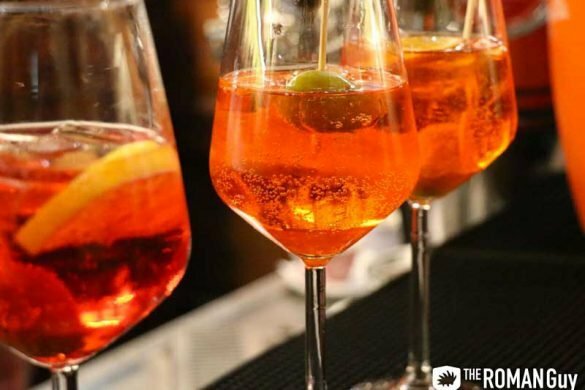 You’ll see locals enjoying a glass with cicchetti even at in the mid-afternoon. Now let’s finally move on to where to eat the best cicchetti in Venice! 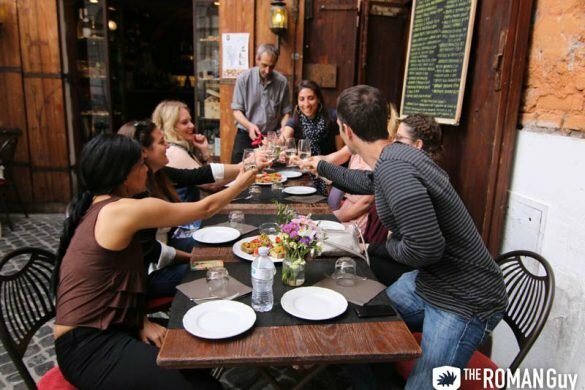 Located in the beautiful Jewish Ghetto area, Al Timon is a favorite among students and young people in Venice. In the warmer months, you can sit on a traditional wooden boat outside and enjoy a drink while floating on the water. The specialties there include grilled polenta bites with fried fish and fresh toasted bread topped with Italian goat cheese and berry compote. Venetians know this bar for its live music performances and a great assortments of fried cicchetti. From “mozzarella in carrozza” (fried mozzarella), to meatballs and fried anchovies, you can enjoy many of the most typical Venetian cicchetti. For a slightly bigger venue, head to Bacarando, a two level bar with a restaurant on the top. 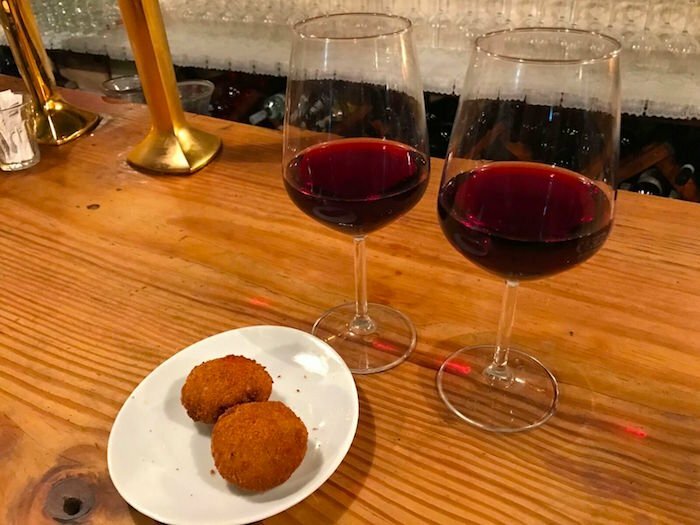 Their wine of the house is only €1 per glass and their selection of €1 cicchetti accommodates everyone, with a selection of vegetarian and vegan bites. Go there on a Wednesday for live music from 7:30 p.m. until 11 p.m. Address: San Marco, 5495, 30124 Venice | Hours: Every day 12 p.m. – 12 a.m. Very close to the Rialto Bridge, this is a perfect spot to grab a bite after a Venice tour. Their most famous cicchetti is fried zucchini flowers stuffed with stockfish mousse. If you prefer having a full meal instead, prices range from €20 to €30 per person. This is the number one spot for the absolute top quality cicchetti and wine in Venice. Right by the Rialto Bridge, it’s the chicest Osteria (wine bar) in the lagoon, with over 875 bottles to choose from. Try one of their bite-sized panini called “meraveje” (marvel in Venetian dialect), stuffed with ham and truffle sauce. Cantinone già Schiavi is a historical bacaro in Venice, opened in 1944. 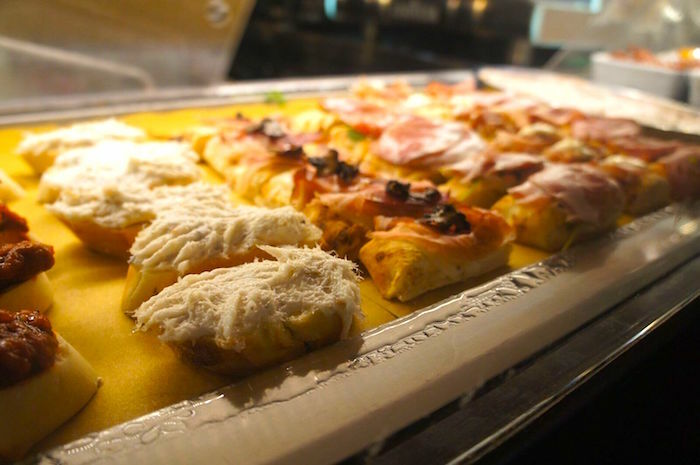 Their awarded Venetian cicchetti consist of thinly sliced toasted bread topped with a careful selection of local products, all for €1,20. All’Arco is one of the tiniest cicchetti bars in Venice, but also offers outside seating, great for people-watching during the warmer months. It’s a family-run business and all the goodies are handmade with care every day. Try their veggie based cicchetti for €2 each, as the fresh produce comes in from a nearby market every day. Address: S. Polo, 436, 30125 Venice | Hours: Every day 8 a.m. – 2:30 p.m. Sunday closed. Many say that Cantina Do Mori is the oldest bacaro in Venice, with its old fashioned atmosphere and huge wooden wine jugs. Their specialty is called “francobollo.” It consists of a tiny square sandwich made with soft bread and stuffed with crab meat, shrimp or fresh meat cuts, just for €1 each! Address: Calle Do Mori, 431, 30125 Venice | Hours: Every day 8 a.m. – 7:30 p.m. Sunday closed. Call it fried cicchetti paradise, starting from €2 each. The portions are abundant and a choice of main courses is available for lunch and dinner. For a local experience, order cicchetti “al banco” (at the counter). If you prefer sitting, remember to ask about the extra service fee! Address: Dorsoduro 2978, Campo Santa Margherita, 30123 Venice | Hours: Every day 8 a.m. – 12 a.m. Sunday closed. You won’t find all the typical cicchetti listed above, but a delicious “tagliere” full of prosciutto, mortadella, porchetta and other fresh meat cuts available. Alla Bifora is perfect place to meet locals but can get crowded during the weekend so be ready to wait a little bit to get a table! 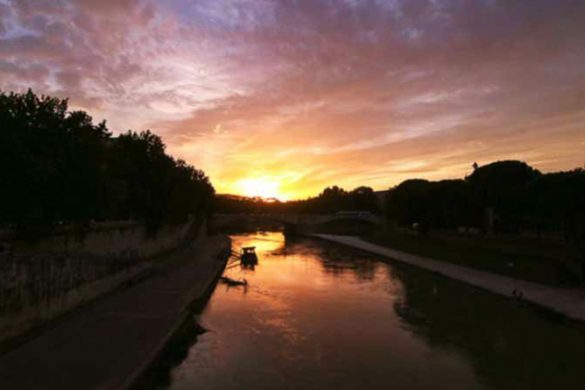 Address: Sestiere Dorsoduro, 2930, 30100 Venice | Hours: Everyday 12p.m. – 2a.m.